Are you looking for best business ideas in South Africa? Do you want to be your own boss by doing business? 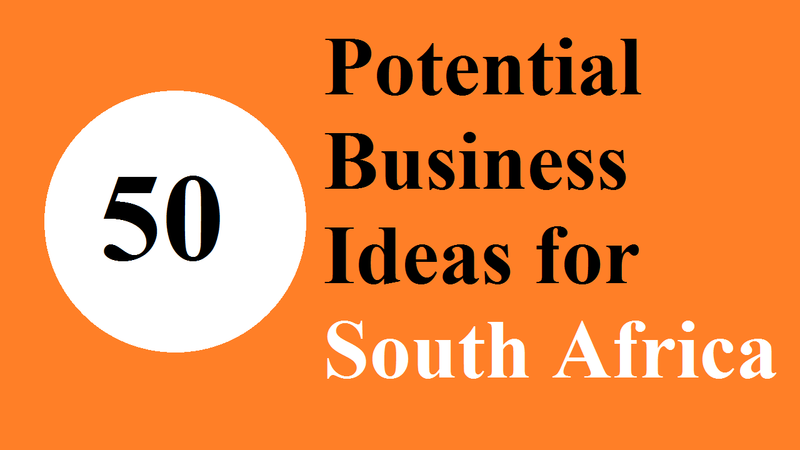 Here are 50 good business ideas for South Africa you can consider. Starting a business is not an easy task. But if you can take the opportunities and risks, it will be like walking in a park. A developing country is always a great place for starting a business. South Africa is one of the developing countries in the world as it is a country of rapid economic development. It is very easy to start a business in South Africa for the business free rules and regulation of the government even if you are not a foreigner. You cannot open a business any place, as “place” is the most important term for the profit of your business. You have to choose the place of your business very carefully. Transportation, as well as the availability of raw materials, should be very developed from the place of the business. Here is the best list of business ideas for South Africa, if you want to start a business for maximum profit. Guiding and giving information to the tourists is one of the smart business in South Africa. We know that South Africa is famous for some beautiful natural places. So, you can open a tourism business by recruiting some local guides. Providing the guides to the tourists in exchange for money is very profitable. The bakery is a profitable business in South Africa. If you skilled in baking and have free time, you can offer the bakery shops to make some bakery item for them in exchange for money. Moreover, if you be famous then you can go for establishing a bakery of your own. In a developing country, people have a little amount of time for doing household chores as they work hard in order to live. So, you can take the opportunity to save them some time and make it your business. Just like laundry business. You can buy some decent washing machine and offer your community for washing their clothes. People always want to eat food. In South Africa, it is not different. A mobile restaurant gives you the chance to serve breakfast, launch, and dinner wherever you want. So, your profit will be up to your skill and your choice of place. And if you manage to do it right, it is quite profitable. Clothing business is a kind of business which will never end. Because people always wear clothes. So, developing country like South Africa is a suitable place for doing clothing business. But to be more specific, budget clothing business is the most profitable. Equally all classes of people can afford this type of clothing. Everyone wants to save time nowadays. Again, everyone has internet today. You can create a website that is called an information portal. Where everyone can find what he or she needs. Like, you can provide a schedule of trains in the portal so that all the people can know the time of the trains at a glance. But where is the profit in doing this? You can offer other companies to give an advertisement on your website in exchange for some money. In South Africa there go a significant amount of tourist in a year. In the main cities, you can open a cuisine restaurant of foreign foods. People who go there can have some taste of home food. And the residential there can have some different types of foods. Your skill, service, and reputation will be the determination of profit. The online marketing not only gives you the opportunity to do business in local areas also it can give you the whole world to do business. If you start an online business in South Africa you can do a lot of profit as there will be no competitor at all as this is a rare business there. Online activities are coming to light in South Africa recently. Taking this opportunity will not let you down. People need the internet nowadays in every step of their life. Not only general people but also the businessman, industries need the internet to do their online work, conferences etc. So, providing them the internet will be very profitable. Growing population making a good opportunity for those who are engaged in waste management. People will love to give you their waste to take away. You can do recycle or sell the waste to a recycling firm. From that, you can make a lot of profit as well as take part to keep the Earth green. An agribusiness means supplying agricultural equipment and service for the farmer. Doing it commercially has potentiality about great profit. For this, you have to know the native crops of South Africa and secondly the growing time of the crops. If you act in time you can make a lot of money with it. There has some high demand for car care products and accessories in South Africa. Because of the price the profit will be moderate. But you can hold this profit by keeping the quality very good. In this world, nowadays people suffer from various diseases very easily. For that pharmacy become a profitable business. All you have to do is link up with a supplier for various types of medicine from various companies.it requires a great capital but profit is also huge in this field. It is a business about sand, cement and other construction material and equipment. It needs a lot of capital. But you can charge heavily according to the works. However, in the end, it will give you a significant amount of profit. The Cab is an important service in the countries like South Africa. As a majority of people do not have a personal car to go places, this service will be more effective at this time. All you have to do just get a license for setting up this business. You have to purchase some cars as well as hire some drivers to run the service. The Grocery store is a profitable business in any country. All you have to do a research on the food habits of the locals. Then contact the wholesalers for the products. The margin of profit in the grocery business is always high. Here import business includes any types of materials which are not available in South Africa. Those materials have a high demand in the country. So, by performing well you can earn a lot of profit. On the other hand, it takes a significant amount of capital. South Africa is a place for various occasions. Almost in every occasion, people use candles. Unique shape, unique size, and perfumed candles have high demand. It requires skill but profit is huge. If people are struggling with something, that’s an opportunity of starting a business. Event management is like one of them. All the people can not manage events like wedding, birthday party, commercial programs etc. So, you can provide them your skill in management as a business. The materials for this business are not expensive and it will give you a good profit too. This is a highly profitable business in South Africa. You can deliver the products which grow or manufactures to the whole world. Like, South Africa is rich in diamonds and you can export diamond jewelry and make a huge profit in no time. This is the business which doesn’t need any investment. After completing the courses on it you can start your service right away in South Africa. In this business, the rate is prefixed. All you have to do to deliver the contents to the client in time. Work more, earn more. The Photography is a booming business in South Africa like the rest of the world. All it requires skill, a camera, and some equipment. With a low investment, you can start this business. You can go on small occasions and do photography. By planning and developing your equipment you can watch the cash roll in. It does not take much to buy a decent camera. When your business will run smoothly, expensive cameras will be available within your reach. If you are good at crafting things, you can spread this skill and earn some money with it. South African people love these types of handmade things as it is recyclable. You can take classes on this and charge them a little fee. However, you can also differentiate the crafting materials or sector and take individual classes on them. More class, more money. Like Handcraft, if you are good at music or expert on playing instruments you can take classes on them. You can conduct classes by yourself. Besides, you can hire people like you to teach people music. This method will give you chance to earn more money and expand your service. If you have a medium amount of money and want to start a business, a retail store is your answer. In South Africa, you can open a retail store by getting the license from the government. You can sell whatever you want. The main criterion for this business is choosing the place. You have to find a place which has a large density of people. Make sure that the number of the competitors in that area should be two in maximum. If you have some skill in sketching you can turn that into in your business. Like music and handcraft, you can also teach people and can earn money easily. You can also sell your sketch portrait or make an exhibition. This will attract the people flawlessly. South Africa is a country of art and nature. Business in that area has a bright future. In South Africa, there is a lot of car wash center. But the people will not mind if someone comes over and washes their car. So, a mobile car wash is a great business in the perspective of opportunity. Once the business goes big, you can go online and spread your business more. If you are good at solving computer problems, you can offer the people your service for a fee. Being a developing country, South Africa needs some expertise in the technological area. The success of the business like this depends on the advertisement. If you advertise yourself and your service aggressively, the chance of profit will be high. If you have experience regarding the tax you can give service to individuals or business firms in South Africa. You can provide the right information to them about tax. You can maintain their book so that they can know the right amount to pay. You can give them advice on various tax matters so that they don’t run afoul of the law. In South Africa, there is various business company launching their product throughout the years. If you are good with words and expert in searching the pros and cons of something, this is your business. You can do it online or offline. You can offer the business companies to give you their product to review it for a fee. An online bookstore can be very profitable in South Africa. In this case, you don’t have to worry about storing books and its cost. People don’t have to go to the store for buying books. They can place an order online and you have to deliver them the books. So, the capital will need for this business is very small. On the other hand, the profits are very handful. The Toys haven’t gone out of fashion yet in this world. In South Africa, children, especially girls like toys. You can make toys and sell them at a reasonable price. In order to be successful, you have to be creative for making toys. Children like colorful toys. So, you have to keep it in mind too. A dietician can be a successful business in South Africa. People are getting conscious about their food nowadays. Keeping their body fit is the main concern there. So, if you are good with the knowledge of food and nutrition, you can give advice to people for a fee. This will not take any investment but profit will be moderate. In South Africa, not everyone can afford new furniture. This is an opportunity for your business. You can buy second-hand furniture to repair them. After that, you can sell them at a reasonable price. People who can’t afford furniture will get a new one. On the other hand, you will get a huge profit. As we know South Africa is a country of diamonds. So, it will be very easy to find raw materials for the jewelry business. You can export jewelry pretty much everywhere in the world. You should train yourself by an expert jeweler first. This business needs a lot of money as capital. However, the profit will be very high as expected. If you have enough money to buy a bus or microbus you can transport kids from home to school and vice versa in South Africa. At first, the progress will be slow. Once the parents can rely on you, you will get their attraction in no time. Because they have to wait in the traffic if they go to get their own child. Being a developing country, the people want to save time as much as possible. Daycare center is a business which does not require any investment in South Africa. If you do work at home you can open a day care agency. You can offer the parents who have a job that they can leave their children with you. So, they can do their job without any pressure. As it doesn’t require any investment all the fees are your profit. The business of disposable cups and plates is a profitable business. Not to mention the competition is low in South Africa in this sector. The demand for this product is very high. Especially from birthday parties to marriage ceremony to daily use in business firms. Despite the investment is low, the profit is huge. Everyone owns a mobile these days. Not to mention in South Africa it is also the same. So, the demand of the mobile accessories is always high. You can buy a shop in the mall and import some high-quality mobile accessories to sell. If you provide a reasonable price and good service, success will come in no time. Real state is a perfect business if you have a lot of money and want that much profit. It is a growing business all over the world. Of course, also in South Africa. At present, the standard of living is increasing in South Africa. So, you can start this business by joining a firm as a broker. After getting some experience and money you can start your own real estate business. Synthetic straight hair is a new trend in South Africa among the teenager even middle age peoples. India is a good source for synthetic hair. So, you can import synthetic hair and sell them at a good price. The margin of profit is always high. Ironing service is like laundry service. You take peoples cloth for ironing in exchange for a fee. People always want to save time. Not different in South Africa. So, people will like this service in a word. And the profit also moderate. South Africa has various tourist places. That’s why tourists go to visit there throughout the year. Similarly, for the business sector. So, the foreigners need help to communicate with the locals. If you know the local language you can start language translator service for the foreigners. This doesn’t require any investment. On the other hand, the profit is moderate. If you are an expert at sewing and has creative skill this business is for you. In this case, you can start your business with your machine. You can sell the clothes on your own. On the other hand, you can train many local people in South Africa. After that, you can create a firm with those people and produce clothes. With this plan, you can earn a huge profit in a country like South Africa. It is a job if you work with one company at a time. But in South Africa, there are a lot of small businesses. Because of poor management, they are struggling at their business. If you are expert enough to take the challenge you can be an administrative consultant for those business firms. The profit in this sector is very high. At present people of South Africa wants to see their residential well organized. If you are good at organizing things you can make it your business. You can offer people to organize their residential, home, office, garden etc. This doesn’t require that big of investment but the profit is large in amount. In South Africa, there are some small business firms who can’t afford the equipment for works. They always search for the equipment and you can offer them those on the lease. This business needs a lot of money as interest. If you maintain this business perfectly, you will see the money roll in. Garden increases the beauty and class of a house. South African weather is great for gardening. Yet many people don’t know about gardening. If you are good at gardening you can offer people to organize their garden. Or you can hire gardeners to work in peoples’ garden. Both methods need less investment, while the profit is large. Residential apartments are building all over the place in South Africa. Glass and aluminum are one of the base materials of this apartments. So, the business of glass and aluminum is considered as a high-profit business. But, you need a significant amount of investment. The Internet is not that cheap yet in South Africa. So, not everyone has the internet connection at their house. You can give an internet café in a place where people gather a lot. Make sure that they can easily get to your place. Make the fees reasonable enough that everyone can use your café. Moreover, your café should be user-friendly in order to get success. Many small businesses in South Africa face storage problem. If you have enough space, you can give storage facilities to those business firms. In exchange for this facility, they will give you rent for significant periods. This business provides a handsome amount of profit. South Africa has a passion for sports. Their athletes took part in almost every competition in the world. So, sports goods business can be a profitable business. It will need a moderate investment to start. Placing this business besides the stadium will boost your customer count along with your profit. Business firms, companies, industries often search for employees In South Africa. If you are an expert in human resource management, you can start a Human Resource agency in order to help them. You can help them to find an efficient candidate. Also, you can give them advice on how to make their employees efficient by training. You can conduct a training program for them. All these can be your service in exchange for money. If you do it correctly, your reputation will do the rest. The margin of profit is always high depending on your reputation. As can be seen, South Africa has the potentiality of various profitable business. We know that it is a developing country. It has many economic problems. That’s why rules and regulations of the government regarding business is very simple. Anyone can start a business by abiding rules.